Women accused of racial defilement were publicly humiliated by being paraded through the streets with placards around their necks proclaiming their crime. German racial laws were strictly enforced and sexual relationships between Germans and Poles were illegal. 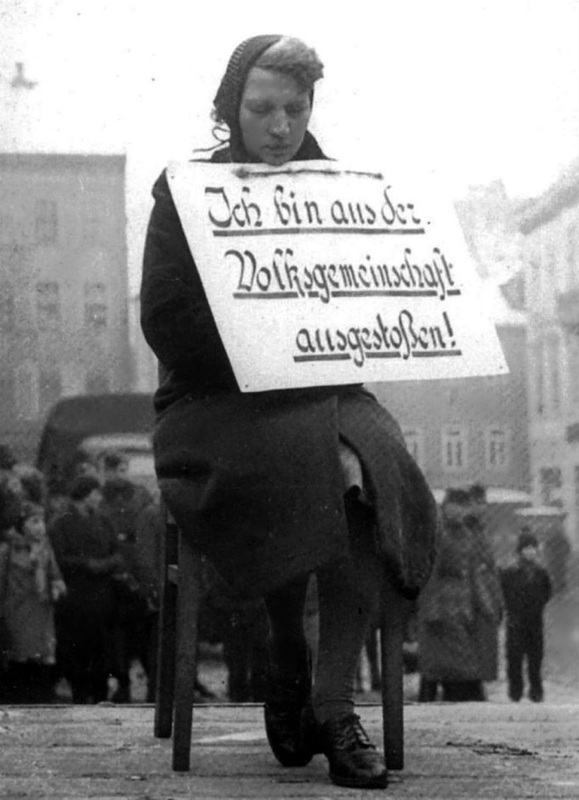 The placard around her neck reads: “Ich bin aus der Volksgemeinschaft ausgestoßen!” (English: “I am expelled from the People’s Community!”). Picture taken in Altenburg, Thuringia, Germany. 7 February 1942. The Nazis issued the Polish decrees on 8 March 1940 which regulated the working and living conditions of Polish laborers (Zivilarbeiter) used during World War II in Germany. The decrees set out that any Pole “who has sexual relations with a German man or woman, or approaches them in any other improper manner, will be punished by death”. The Gestapo was extremely vigilant about sexual relations between Germans and Poles and pursued any case relentlessly where this was suspected. Persons suspected of having sexual relations with non-Aryans were charged with Rassenschande (racial defilement) and tried in the regular courts. Evidence provided to the Gestapo for such cases was largely provided by ordinary citizens such as neighbors, co-workers, or other informants. Persons accused of race defilement were publicly humiliated by being paraded through the streets with a placard around their necks detailing their crime. Those convicted were typically sentenced to prison terms, and (subsequent to 8 March 1938) upon completing their sentences were re-arrested by the Gestapo and sent to Nazi concentration camps. As the law did not permit capital punishment for racial defilement, special courts were convened to allow the death penalty for some cases. According to an article in Der Spiegel, between 1936 and 1943 the Nazis accused 1,580 persons of race defilement with 429 of them being convicted. Germany could use some similar public shaming of women consorting with foreigners nowadays. Ma'am, as a proud mixed raced child, I say that you're a racist bigot that needs to open your mind. Germany does not live in hatred anymore and you no longer have the right to shame fellow German women for socializing and loving people of different races, cultures, skin tones, etc. They are human beings like you and me. It's 2017 going to be 2018, hug a lamp and lighten the hell up! C.A. Sellers - a bigot is someone who will not tolerate the point of view of another. Ira has a racist (more on this later) viewpoint that you refuse to tolerate, which makes you the bigot. In many respects Jews can be rewarded as the most successful group of people on the planet. One of the key fonts of Jewish success is the Jewish extreme aversion to breeding out, which genetically has been determined at less than 0.5% of each Jewish generation over the entirety of Jewish history. That is simply an astounding feat of group discipline. Jewish people are smart, they have no desire to degrade their birthright by experimenting with foreign genetics. As for the great taboo of our time, racism, as defined by The Religion of Internationalism, Political Correctness and Multiculturalism (TRIPCM) , racism can now mean anything from: the Nazi genocidal insanity, to the fact that one prefers one's own kind, to, the fact that a high performing cohort happens not to contain a plethora of ethnicities. Lumping together all three of these scenarios as TRIPCM does under the one word, 'racism' is just insane.